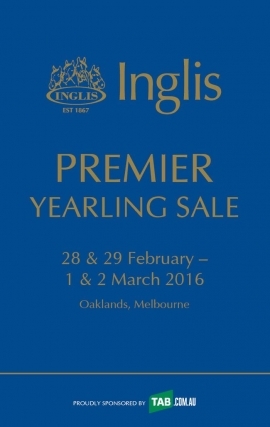 The catalogue is now available online for the 2016 Inglis Premier Yearling Sale, to be held on 28, 29 February and 1, 2 March at the Inglis Oaklands Sales Complex. Prepare to turn your passion into success with 755 select Lots catalogued for Victoria’s headline yearling sale. CLICK HERE to view the catalogue online or HERE to download it via the Inglis Sales iPad App. Proven stallions with strong representation (5 or more) include Redoute’s Choice, Fastnet Rock, Snitzel, Sebring, High Chaparral, I Am Invincible, Not A Single Doubt, Medaglia d’Oro, Choisir, Bel Esprit, Hinchinbrook, Star Witness, Starspangledbanner, Bernardini, Commands, Reward For Effort and Canford Cliffs. 2016’s exciting group of first season sires are also well-represented, with progeny by Pierro, All Too Hard, Excelebration, Ocean Park, Dalakhani, Americain, Animal Kingdom, Delago Deluxe, Your Song, Bullet Train, Harbour Watch, Niagara, Needs Further, Reliable Man, Squamosa and Super Easy offered at the sale.